ISSUE 89 (NOV-DEC, 2018) is on sale and here's a taste of what to expect . . . In September, Arena-Essex became the latest in a long line of former speedway venues. MARTIN NEAL was at the Purfleet track on an emotional night to speak to some of the key figures in the early part of the club's 34-year history, including the first 1984 race winner Alan Sage, plus Andrew Silver, Martin Goodwin, Ian Humphreys, Troy Pratt, Sean Barker and former boss Peter Thorogood. 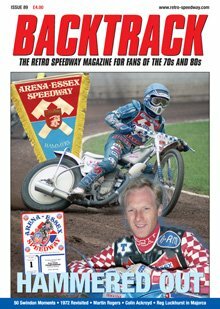 As our separate piece to the main Arena feature reveals, the Essex track became the 56th British venue lost to speedway since 1970 (soon followed by Rye House). ANDREW SKEELS reflects on a memorable year in which Ivan Mauger won his fourth individual world title, led Great Britain to World Team Cup glory and guided Belle Vue to the British League and KO Cup double, while Crewe were crowned kings of Division Two, England won the World Pairs for the first time and the BL welcomed overseas newcomers in Billy Sanders and Tommy Jansson. ROB PEASLEY looks at the history of the first club to achieve back-to-back league titles in the top two divisions and where Blunsdon heroes included Barry Briggs, Martin Ashby, Bob Kilby, Phil Crump, Jimmy Nilsen and Leigh Adams. In part two of PHIL CHARD'S interview with Reg Luckhurst, the popular former world finalist recalls his role in introducing the sport to the Spanish island of Majorca and explains why the island dream failed to take off, before returning to mainland Spain 20 years later to run three meetings in Valencia. The ex-Wimbledon and West Ham star also talks technical about his RL Weslake conversion and the tragic loss of Dons team-mate Tommy Jansson. 'Lucky' says: “The first meeting we held, we had nearly 3,000 spectators. Bernie and Ian thought they’d pull in British speedway supporters on holiday but it was the Spanish riders’ families and friends who came, locals supporting their boys." Although best known as the hands-on promoter at three tracks in the 80s, Martin Rogers established himself as one of speedway's top scribes long before then. TONY McDONALD finds out more about this prolific, media-savvy wordsmith. Martin says: "These days, a lot of tracks have a caller in the box and a centre green presenter but in my general manager spell at Lynn I did both the pre-match parade and the general announcing. The intros always were great fun – Dave Lanning and Trevor Redmond, proper showmen, were my inspiration in that area. From both I learned how important it is to properly acknowledge the status and appeal of each and every rider from one to seven. They're all stars." ROB PEASLEY catches up with the once promising Oxford and Eastbourne prospect who was forced to quit racing at 25 and is now battling MS.
Colin says: “Bernard Crapper and John Payne had a bet between them that I would reach an average of 6.00 by the end of my first full season. I didn’t realise until Bernard came up to me towards the end of the season and told me: ‘I need you to have a good one tonight!’. It was great fun at Oxford and I grew in confidence." DAVID BERESFORD re-visits the once quaint village of Partington, where world champions, international stars and numerous other speedway and grasstrack riders had their first skid on the farm owned by Peter Collins' dad. “Dad’s farm was a busy place,” recalled PC, “and not just with farming. There was always a group of us racing around on something even before we built our makeshift track on land that was reclaimed when the River Mersey was redirected during the building of the Manchester Ship Canal. Dad would be around and George Morton (father of Dave and Chris) was often there mending this, welding that, and his wife Hilary regularly provided first aid!" With the 2018 season now finished, DOUG NICOLSON hopes that fans made a point of getting along to their track's final meeting of the year because, well, you never know . . . Interesting article written by journalist, ex-promoter and regular Backtrack columist Martin Rogers. Spoke a lot of sense and although I never totally agreed with some of his tantrums (Oxford winning at King's Lynn in 1984 for example) how speedway could do with the likes of him now.